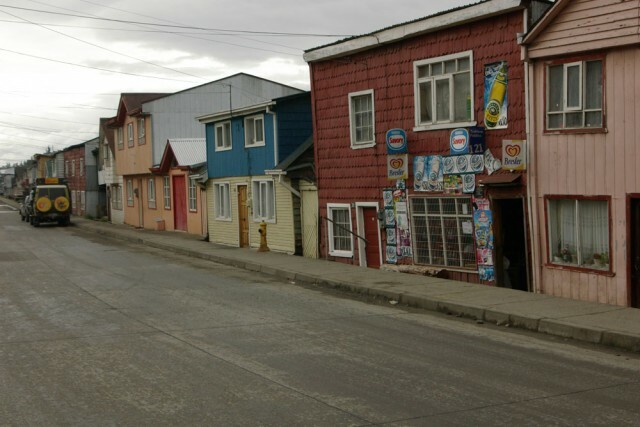 Chile Chico, our entry point back into Chile – in days gone by a copper mining town – the blue tinged mountains around the village still evidence of the ore. A ferry port on the south side of Lago General Carrera and now gateway to the west with the completion of a most stunning gravel road at the base of the Andes along the edge of the lake. No sooner had we entered the village and parked the car when a youngster ran up to us and shouts out “Are you guys from South Africa?” – “Yes indeed” was our reply. It turns out he had noticed the South African emblem on the side of the front mudguards of Tubby and that he was a fellow countryman – albeit a backpacker. He introduced us to his Australian buddies and co-travelers and invited us for a cup of coffee. A most welcome respite, did some shopping and on the road again. 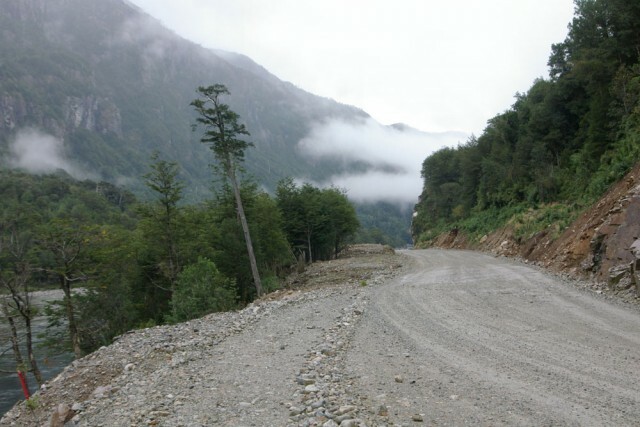 This road being one of the most challenging feats of construction I have ever come across and I am led to believe one of the most expensive ever endeavored by the Chilean Government. The road hewn out of solid rock skirts the edge of the lake with the Andes all around, to our left towering above us, in front and across the lake a more majestic setting one cannot imagine. It snakes its way along with steep inclines to a dizzy height. Near the top you feel as if you are driving up a ramp towards heaven then the inevitable hair-raising descent – zigzagging hairpin bends winding down to the water’s edge then up, up to sheer precipices the road so narrow – at times a single track – only one vehicle able to negotiate the route, it wove its way 120 kms to the west. A sheer masterpiece of construction. Eventually late afternoon we slowly dropped down into a valley and ventured towards the tiny ferry harbor of Porto Guadal. We were in Region XI of Chile, Aisen. Extremely cold amongst these snow-capped mountains at water’s edge we decided to stop over in a log-cabin overlooking the lake – a most scenic setting. Large wood burning hearth – cosy and comfortable for the night. We left reasonably early the following day and turned north on the main road – Ruta 7 – known as the Camino Austral or the Longitudinal Highway and referred to as “Pinochet’s Folly.” During the dictatorship 1973-1989 he envisaged the road linking the north from Puerto Montt to the pioneer outpost of Puerto Yungay in the south a distance of 1100 kms parallel to the Argentine border. It was his dream. He reasoned that this road would lead to investment and development down south but the costs were insurmountable. 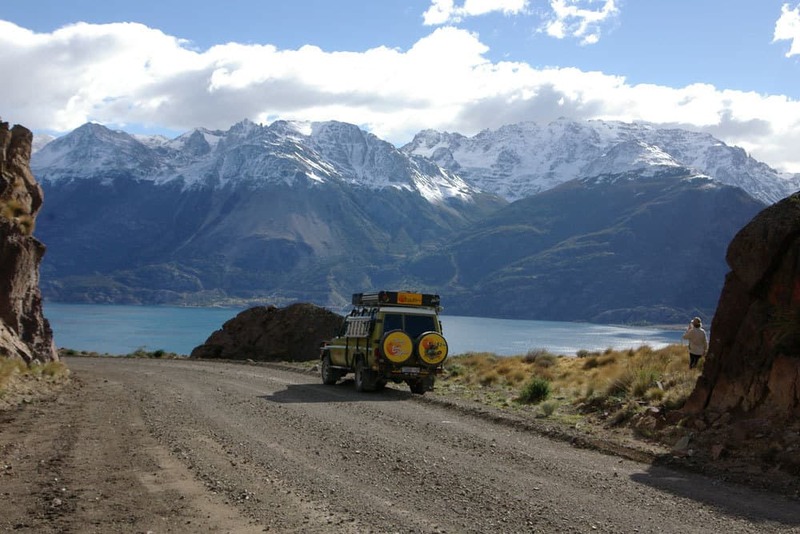 A road to circumvent lakes, traverse across uncountable rivers, find routes across the Andes seemed ridiculous but construction has gone ahead and even some Chilean officials of late, envisage that this road could eventually wind up as far south as Puerto Natales. Personally I believe it is not such a folly. 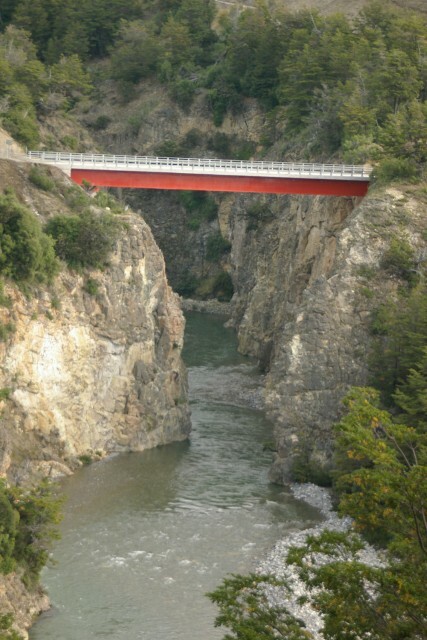 It is a matter of time – not in the immediate future but with road and bridge construction taking place presently, the inevitable will happen – north and south will be connected by Ruta 7 – The Camino Austral – it’s called development. The cost? Heaven only knows. 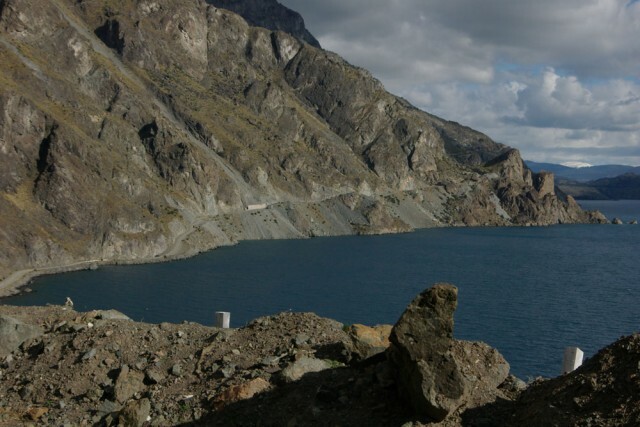 Aisen has been likened to South Island, New Zealand and even Alaska’s Inside Passage a terrain with aquamarine rivers, lakes, fjords and the Andes, unbelievably gorgeous lush vegetation growing on the slopes of the mountains, in the valleys and along all the waterways. 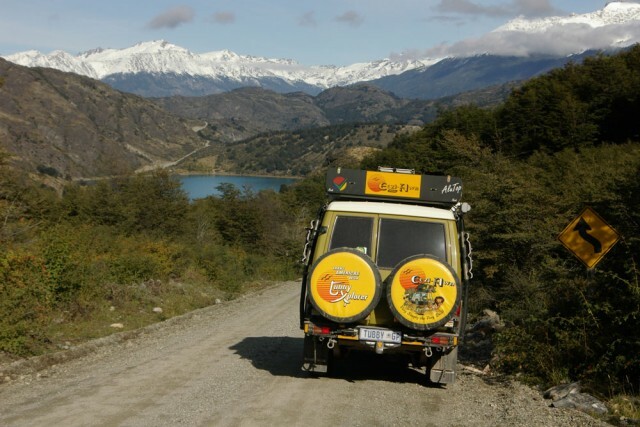 Driving along the ripio Ruta 7 skirting the lake to the west traveling north we came to the conclusion that the info the British motor cyclist gave us at Torres del Paine was the best of the best – it was a bonus bar none. The road continued north east of Lago General Carrera and then eventually slowly climbing steeply up emerging high up above the lake – looking across the still waters at a distance we could see the road we had traversed the previous day hewn out of the rock clinging to the edge of the mountain towering above it. Onwards we drove via Puerto Tranquilo eventually arriving at the turn off into Villa Cerro Costillo a typical pioneer settlement of cement block houses with corrugated iron roofs, plus a few scattered Chilote shingle styled houses, almost dusk but we decided to move on. A few kilometres out of the village we found a campsite on a farm at the foothills of the snow-capped Andes – set up camp – bitterly cold. Our host even offered to put us up in his casa (house), most grateful but graciously declined. We took out all of our blankets and duvets and were snug like bugs in the rooftop tent – slept like logs only to be woken early by the loud crowing of a cockerel. We breakfasted on tea, cereal and fruit surrounded by the farmyard gang. Packed up and vamoosed out of there onto a new concrete paved highway, immediately a run up a steep incline, the road hairpin after hairpin zigzagging its way back into the mountains until we reached the snow line hardly visible since it had last snowed a week previously – ice still visible in the low-lying areas along the gullies and crevices at the edge of the road – cold enough to make an African shiver. Reaching the summit, we called a short halt – Teatime. It breaks the journey but it also gives us the opportunity to indulge a little on tea and decadent pastries or empanadas (pies). No wonder we have put on weight!!!! A short stop and time to hit the road heading north descending towards the regional capitol along the Camino Austral. 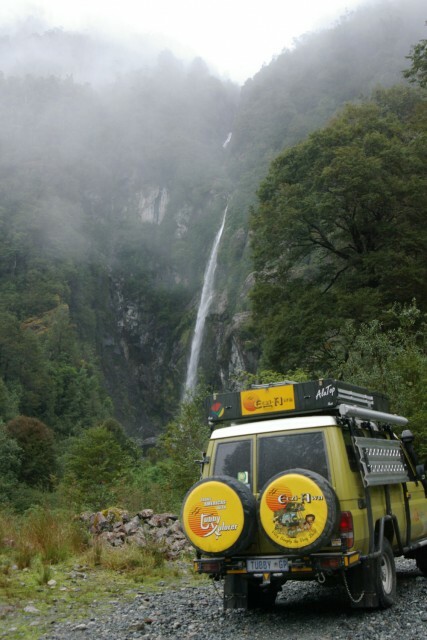 Cohaique nestled at the base of a basalt massif on the confluence of two rivers – Cohaique and Rio Simpson. Late morning we rolled into town, all quiet on the western front except for one tiny kiosko open for the necessary replacement of victuals we required then setting forth again. 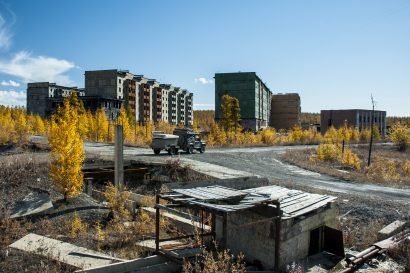 No sooner had we left the outer reaches the road snaked up out of the valley leaving the city behind. 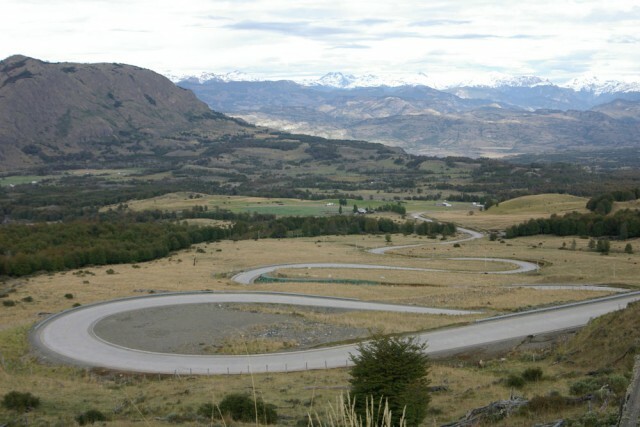 An excellent paved road to the west towards the coastal towns of Aisen and Porto Chacabuco. A most scenic drive in bright sunshine along a meandering river on the one side and large forested overhanging cliffs to our right at the edge of the highway. Arriving mid-afternoon we found Puerto Aisen almost deserted. 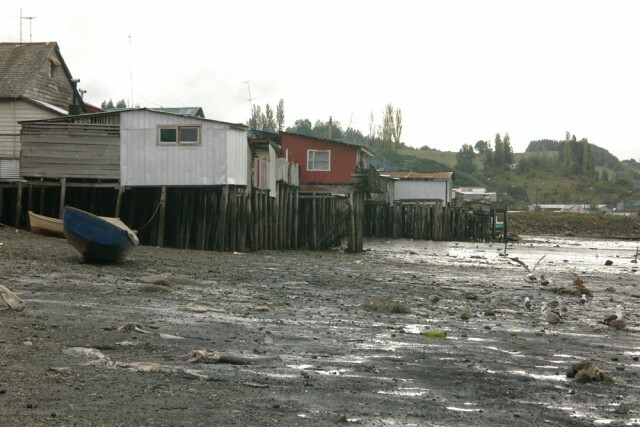 We ambled across the river to the Port of Chacabuco which has displaced Aisen as the port servicing the area as its harbour had silted up. It is an important harbor frequented by ferries from Puerto Montt in the north, the Island of Chiloe in the west and as far away as Puerto Natales in the south. Both ports being nondescript and of little interest, we decided not to stop over but rather retrace our tracks by approximately 20 kms and head north to camp en route in a National Park but on arrival the gate was closed so we trundled on until finally at dusk, high up in the mountains, surrounded mainly by southern beech forests and shrouded in mist approached a tiny village, Villa Amangual dominated by a Chilote styled shingled church. It was time to call it a day – rented a room for the night – timber house standing on stilts. It seems to be the local architecture to build houses standing off the ground in this part of the world. The soil is most unstable with so much water underfoot. The following morning the village still shrouded in mist – slightly drizzling – and with visibility virtually nil we took off ever north again dropping down into a valley leaving Amangual crossing over an amazing suspension bridge, this time the wild domain and somewhat remote Parque Nacional Quelat beckoned us. This Park straddles Ruta 7 supposed to be a longitudinal highway – let me try and describe this roller-coaster road that snaked through it. Imagine it being narrow, constructed of an aggregate of pebbles and cobbles tightly compacted to form a surface raised in the centre like a half moon, the apex hardly wide enough for one vehicle to negotiate and the verges tapering down each side to water-logged gullies at the edge of immensely dense vegetation and on top of this the surface drenched by persistent mist and drizzle, winding its way along in and out, up and down the terrain parallel to aquamarine rivers with extremely wide cobbled beaches, meandering along the valleys, blind rises, single track timber bridges with only two uprights each end demarcating the width of the bridge, hairpin bends, rising gradients, uphill and downhill passes hugging the mountains with steep precipices and to top it all no safety barriers. In this semi-twilight Tubby with headlights on wending our way forth virtually trimming the vegetation on both sides you pray that there would be no traffic en route today, you’re almost lulled into a state of security for the lack of vehicles when suddenly you observe lights fast approaching in your rear-view mirror. 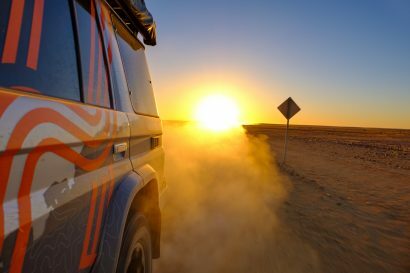 You slow down, edge over as far as you possibly can and before you know it – woosh!! Tubby is covered in grime, windscreen wipers working ten to the dozen and red lights disappearing into the distance. Time passes by, we relax again, Tubby leaving a trail of spray behind and humming along. Then way in the distance we notice lights, the first sign of approaching traffic suddenly appearing out of the mist. A huge truck comes bearing down on us. Now one wishes that Tubby could concertina into a narrow razor blade – you try and find space, two wheels rolling in the right-hand gully dragging in the mud and slush and then before you can say “Jack shee .t” this huge six-wheeler thunders past, millimetres to spare and you right yourself back onto the apex at the centre of the road and courageously continue. However, there is no relaxation or letting up – the next obstacle a hairpin bend, a tight corner, you have to down shift long before you get there, the surface is so wet and slippery it is like driving on marbles. You dare not slam on brakes lest you lose control of the vehicle – so whether you are on the straight, crawling uphill or grinding downhill in second gear you carefully approach each and every bend with utmost caution. Come to think of it an adventure trail par excellence. So here we were wending our way through the National Parque of Quelat enjoying all the aspects of this wild terrain, numerous waterfalls tumbling down the crevasses of the surrounding mountains appearing from a dizzy height out of the umbrella of mist blanketing the valleys one could imagine the movie “The River Runs Through it” starring Brad Pitt being filmed here. Then when you are negotiating narrow downhill descents you see water disappearing over the edges of rock beneath you and drop into the cauldrons below. With an average rainfall of 4,000 mm per annum it is no wonder it is so lush all around. Steaming ahead, low cloud in the valleys we did not get to see what was above us nor got a visual of the hanging glacier or towering volcanoes en route. Almost lunchtime we rolled into Puerto Puyuhuapi, a small village situated at the end of a narrow fjord and one of the oldest settlements along the Camino Austral. Germans settled here as early as 1935. We wound up in a German restaurant – the speciality for the day being “Suppe.” This consisted of a seafood broth mostly of crab to which the chef added shrimps, salmon, scallops, other seafood and vegetables. Absolutely mouth-watering. For dessert “Shokolade Torte” a chunk of chocolate cake to die for!!!! Decadent and weight-watchers revenge. All this rounded off with a cafe con leche (coffee with milk). Sufficed to say we waddled back to Tubby, and ventured forth eventually over-nighting in La Junta our last hangout en route before we set off again the next morning for Chaiten. Back onto Camino Austral. It was heavily overcast when we arrived in the harbor village at mid-day and not a soul in sight. Found the offices of Trans-Marchillay, the company in charge of most of the ferries in this area, camped outside and waited until 20.00 hours before we could purchase our tickets to board and sail to Puerto Montt in the north – a trip lasting ten hours. We sailed at mid-night and slept on the ferry. A most uncomfortable night but one has to accept inconveniences, after all it is part and parcel of the adventure. Mid morning the following day we docked at Puerto Montt one of Chiles most important southern cities also settled by Germans in the mid 19th Century. It enjoys a spectacular setting at the edge of Los Lagos – one of the oldest buildings the Iglesia Cathedral was built way back in 1856 entirely of Alerce timber, trees which are now endangered and highly protected. A clear sunny day, drove the Land Cruiser off the ferry, toodled into town, parked and walked into the centre, had lunch, cashed some traveller’s cheques and meandered out of there. This time a magnificent highway down south to the Island of Chiloe. 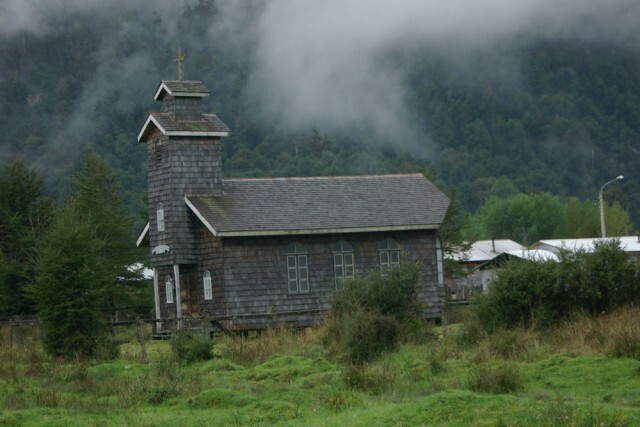 The Isla Grande Chiloe is an island linked to the Chilean mainland by frequent ferries. The countryside is undulating covered with dense forest, lush vegetation and riddled with waterways. It is known for its Chilote shingled houses and churches, the inhabitants are called Chilotes. A short trip across the Canal de Chacao and we were on our way to the city of Ancud situated on the north-west coast of the island. The city was founded in 1767 mainly to defend the Chilean coastline against foreign intrusion. It was a Spanish stronghold until their defeat in 1826. Today it is a small fishing port. Here we took up residence in one of the finest hostals en route to date overlooking the bay of Ancud. A typical hostal provides a bedroom normally with shared bathroom, communal kitchen, dining room and lounge. Here we were able to cook the most delicious salmon which we had bought at a local fishmonger for a song. We spent a couple of days on this island touring, driving out each day in a different direction. One of the most interesting destinations was the capital situated on a sheltered estuary on the eastern shore of the island, Castro, with its picturesque colorful neighbourhoods and in particular the “Palifitos” distinctive shingled houses constructed along the shore-line level with the road on one side and on the sea side erected on wooden stilts so that with the rising tide the fishermen anchor their boats at the back door. During our expedition in South America we endeavored to indulge in the local fare. In Tierra del Fuego the order of the day was a huge steak topped with loads of onions and a fried egg. Absolutely delicious. Downtown in Ancud the speciality of the day was Curanto (sea-food stew) a huge plate consisting mostly of black mussels, a number of clams, a piece of fish, a bit of chicken, a chunk of gammon, a sausage plus potato dumplings and should you so desire you could pour the broth in which all this was cooked and served in a cup as gravy. Margaret and I could not make up our minds whether we enjoyed it or not. The food was most unusual and we believed that the mixture was an acquired taste. Having spent a week on the island at the hostel catching up with correspondence, e-mails and piles of washing we decided it was time to move on and continue the odyssey.